The New York Red Bulls managed to take all three points on offer from this mid-week battle of Eastern Conference Titans (full highlights here). All it took was an unbelievable Thierry Henry golazo (and a Brandon Barklage goal-line cleareance) and, boom, the Red Bulls are within one point of Conference leaders Sporting KC. If ever there was a massively ill-advised fixture, this was it (mates). The temperature, at kick-off, was 101 degrees fahrenheit and a good number of those with tickets stayed away. The absurd heat made this one almost painful to watch, as both teams looked lethargic, especially in the first half. The 61st minute introduction of Connor Lade worked wonders for the Red Bulls, as the diminutive sparkplug really caused havoc amongst the Fire defense. The lone goal, in fact, started when Lade dished the ball off to Sebastien LeToux and the newly acquired Frenchman played a sublime ball to Thierry Henry, out on the left. What followed was a moment of brilliance, as the French legend brought down the ball with his chest, then took a quick left-footed shot that sailed over Fire keeper Sean Johnson. It has to be seen to be believed, and you can click on the video above to check it out. This goal was such a work of art that the video should go on display at the Louvre. 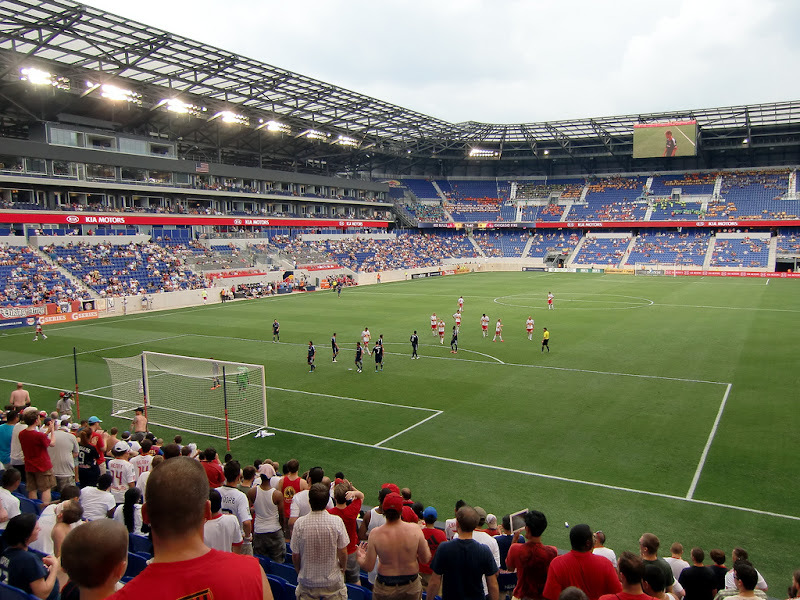 An 83rd minute goal-line clearance, from Brandon Barklage, was needed to preserve the result and the Red Bulls survived with the victory and the shutout. Next up, the Philadelphia Union this coming Saturday. Bring it on, DOOP Boys! Please see the video top for pre-game and half-time comments and predictions. You can click here for full time comments. You can click here for my photo album (slide show here). You can also click here for a very nice album, courtesy of Matt Kremkau. Please, Chris Heck - no more 1:00pm mid-week games, during the hot Summer months. I hope you learned your lesson from this massive attendance FAIL. I also hope to see you all this coming Saturday @The Cathedral of Football, Red Bull Arena (built by Makita) for the massive fixture that will be Red Bulls vs Union. Viper Out!